When people think of Southwest Florida, they think of the sun, the beautiful winter weather, and the water. Escaping icy temperatures and crowded cities, life here revolves around a relaxed pace and outdoor lifestyle. Many people move here for their lanai so here we will answer three commonly asked questions about furnishing this important space. When looking for outdoor furniture, what materials should I consider? While there are several options, unless you are going with a Teak frame, we always suggest you choose 100% aluminum. Even if you pick furniture wrapped with synthetic wicker, the frame is the foundation of your furniture and choosing one that’s 100% aluminum ensures it will last years. A word of caution: some manufacturers label products as aluminum but it will often be combined with other metals creating a frame that will rust over time. This is something we see at big box stores. We also suggest going with synthetic wicker. Wicker is not actually a material, but a method of weaving. Traditionally, natural plant materials were used to produce a variety of products and wicker was originally made from natural fibers, like rattan. Resin is now used to mimic the look of wicker while creating furniture that is very easy to maintain. 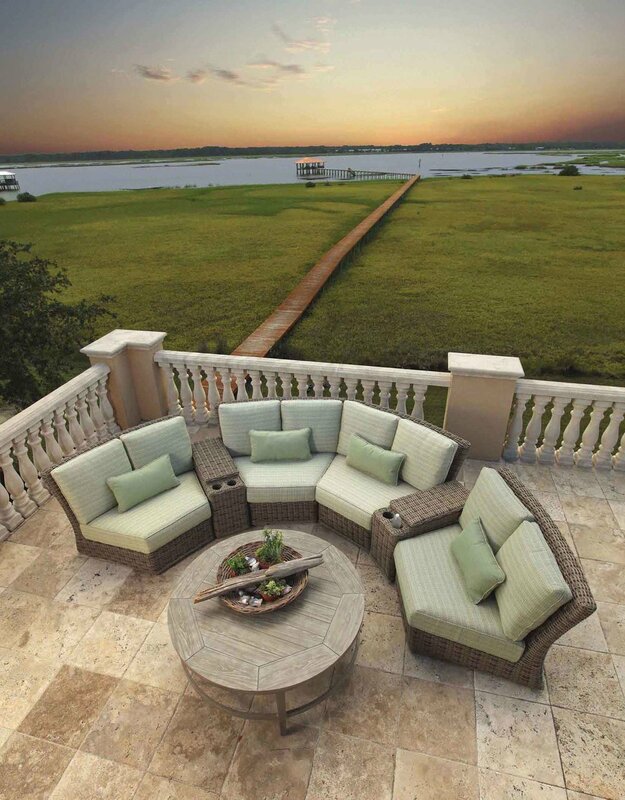 Synthetic polyethylene fiber resin wicker is durable, resistant to the sun’s UV radiation and to water - the perfect material for Southwest Florida, especially if you live near the corrosive salt air of the Gulf of Mexico. When resin wicker is used over an aluminum frame, it creates lightweight outdoor furniture with a classic feel. If you want the traditional look of teak, do some research before you buy. While it’s beautiful and timeless, keeping the look of new, polished teak requires maintenance. Regular cleaning will help prevent mildew build-up and discoloration. A quick wash with mild soap and water with some bleach or vinegar mixed in usually does the trick. Use a soft plastic brush as metal brushes can scratch and damage the wood’s surface. If you want to keep the natural golden color of teak, you need to oil the furniture every three or four months. Keeping the furniture out of direct sunlight also helps preserve the color. If you don’t want to do that work, weathered teak is a popular look. Without the protective oil covering teak takes on a beautiful, antiqued look with silver and grey hues. I am worried about fabrics molding in the Florida heat and humidity. What are my options for durable fabrics? Mold loves dirt. If you keep your cushions and fabric surfaces as dirt free as possible, you will eliminate most of your mold problems. Shake cushions off once a week, or at least brush off visible dirt as often as possible. If cushions get really dirty from pets, kids, or entertaining mishaps, just clean the cushions with a solution of mild soap and water, rinse thoroughly, and then allow to dry. The best outdoor fabrics are solution dyed acrylics. Acrylic is a synthetic fiber with a soft wool like feel and is extremely colorfast and resistant to stains. The solution dyeing process is an intensive one and it turns acrylic into an amazingly strong fiber. During this process, the acrylic fiber is actually dyed while it is still in a viscous form. The color is completely locked in before the fiber even becomes a solid. This means you can use bleach to clean tough stains and the color won’t fade. Look for marine-grade cushions. Found on boats, these cushions won’t fall apart after getting wet because they are made to get soaked and then dry completely in a marine environment. Don’t spend the money to get the right fabric if you are going to wrap it around cushions that will decay within a couple years. Do you have any tips for me as I plan out the seating areas in my lanai? With an extensive background in interior design, we suggest approaching your lanai like any other area of your house. How you will be using the space and how much time will you spend in your outdoor living space? Will this be a main entertaining area? When will you be using the lanai? How do you want to feel when you’re in the space? Next, take a look at the space you have available. While many lanais are custom-designed here in Southwest Florida and people are able to create separate seating groups for lounging and eating, sometimes you won’t have that luxury. Knowing how you will use the space helps you decide which seating groups you want to emphasize and which aren’t as important. For example, if you know you love to have after dinner drinks outside you might opt for a smaller outdoor dining area and use the extra space for more seating and lounging options. As you think about laying out your lanai, pick a focal point: the view of the beach or golf course, a fireplace, the pool, etc. Orientate the main seating areas around that focal point, making it the anchor point for the lanai. Keep scale in mind. We take measurements of your lanai and then use computer programs to make sure your furniture isn’t dwarfed by or dominate your space. You might like the look of substantial wicker pieces but if your lanai can’t support their “weight”, your space will feel cramped. The same goes for pieces with thin lines—they can be overtaken by the scale of a larger lanai so you will need to think about adding elements to help your furniture feel like it fits. Consider carrying the colors and themes from inside your home outside. Seamless indoor/outdoor living is easiest to achieve when there’s a cohesive flow between rooms. Bring photos, pillows, or fabric and paint swatches with you when you go shopping to match the colors and look of your interior space with your exterior furniture.